Maybe this’ll sound a little snobbish and petty of me, but I recently received the final two books necessary to fulfill my Nevada Barr Anna Pigeon Mysteries collection. So, yes! 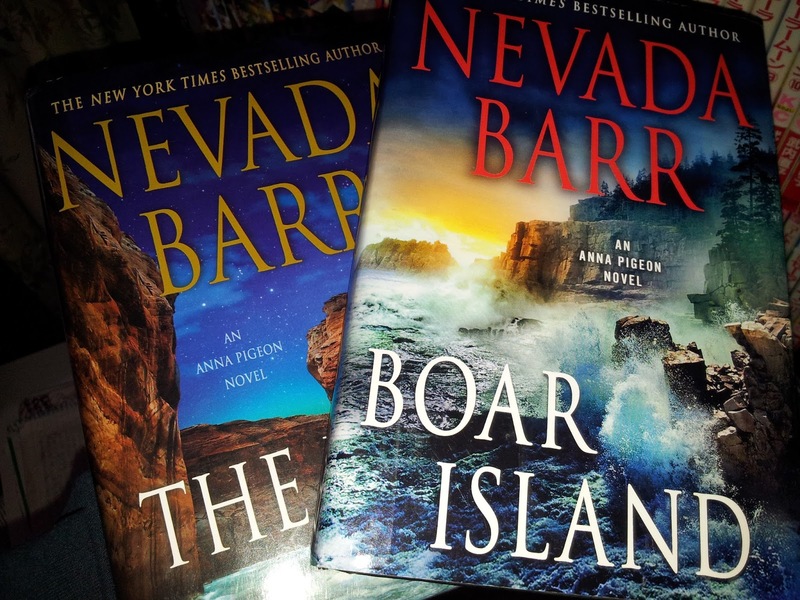 Finally I have my own copy of book #17 and 18; The Rope and Boar Island respectively. Anyway, I ordered the two through Thriftbooks.com; bypassing Amazon and Bookoutlet, I figured I would gives these guys a try. Besides, I did the math and it was just cheaper to go with Thriftbooks. Especially considering I’ve already read the books over the summer, via the public library. I just needed personal copies to fill my shelf. You know, in case one wants to re-read titles without fuss. Standing at the kitchen table, I unwrapped them and a light expletive just burst out. Had I done my research, I probably would’ve known better before I ordered them. Yet, it is what it is. Still why was I surprised to find my copies were book club editions? Then I thought about why in the hell do I carry this tiny stigma against them? Part of me blames the OCD half of me. Or the collector who wants his shelf of series-related books to look uniform with one another. I mean not that I’m totally against book club editions, but that could be part of the blame. But hey, I'm not the only one! Nonetheless, I decided to turn this scenario into a post on 6 things to look for between book club edition books and titles from the original publishing house. 1. The obvious difference is the size of the book. Book Club Editions are often smaller than the same title sent from the publishing house. 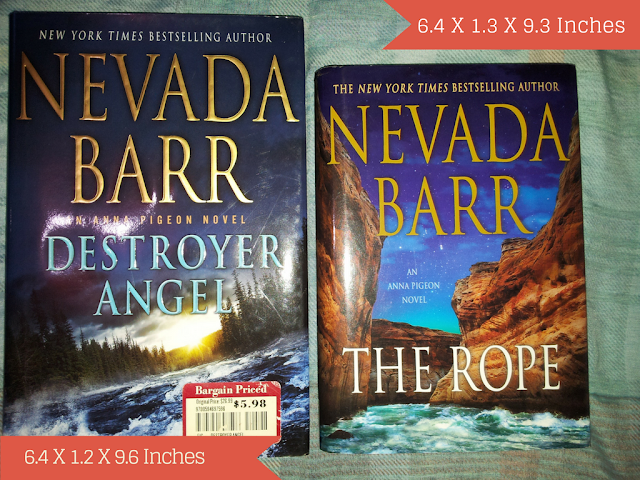 I don’t have a “house” copy of the The Rope to match book-for-book, but Destroyer Angel follows in the Anna Pigeon series. Identical in their make-up, cover art, uniform, and marketability techniques; you get the picture. 2. Besides size and dimensions, Book Club covers lack the graphical effects of books sent from publishing houses. 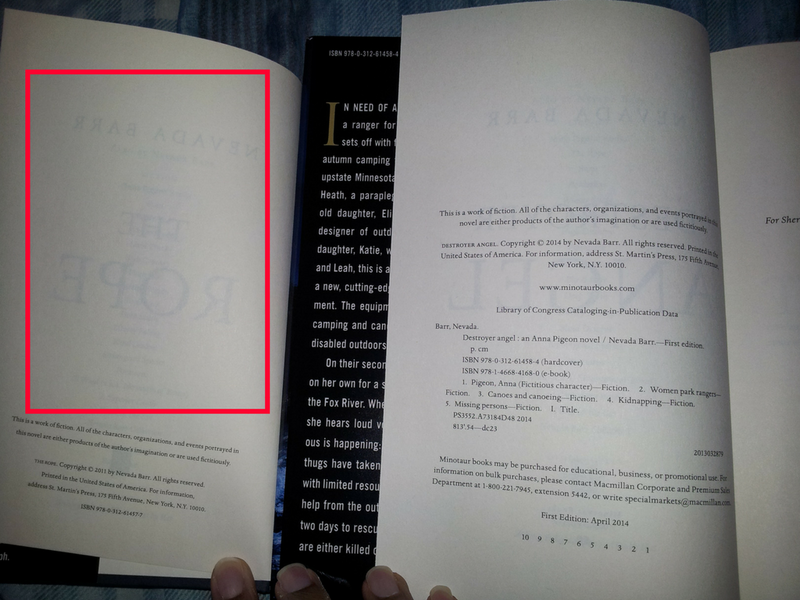 In the above image, notice how the publishing house book has a metallic gold tint and 3d effect to the author's name and book's title. Whereas the BCE is just one flat cover. 3. BCE are also printed with lower quality paper. This includes the dust-jacket. They are also lighter in weight than titles from the publishing house. 4. Pricing is removed from BCE books‘ inside flaps (as well as near the ISBN number on the back). 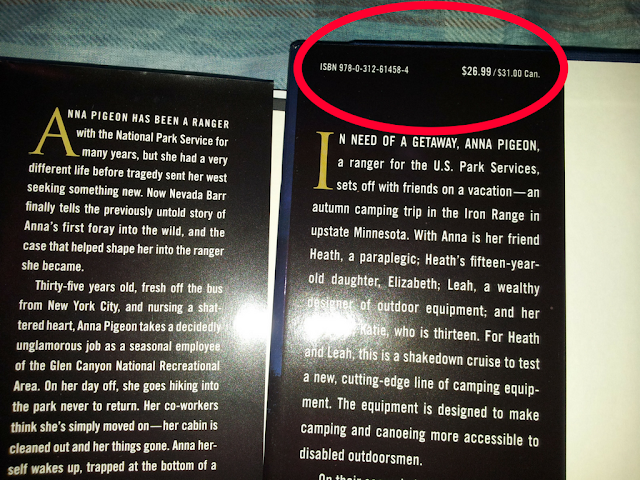 Because BCE books are printed for certain book clubs, pricing a book is most likely irrelevant. Still, I’m sure there are exceptions to this. SIDENOTE: Once or twice you’ll find a BCE book in the bargain bin of a chain bookstore. Though it usually comes with a price sticker reflecting its position as a bargain buy. 5. 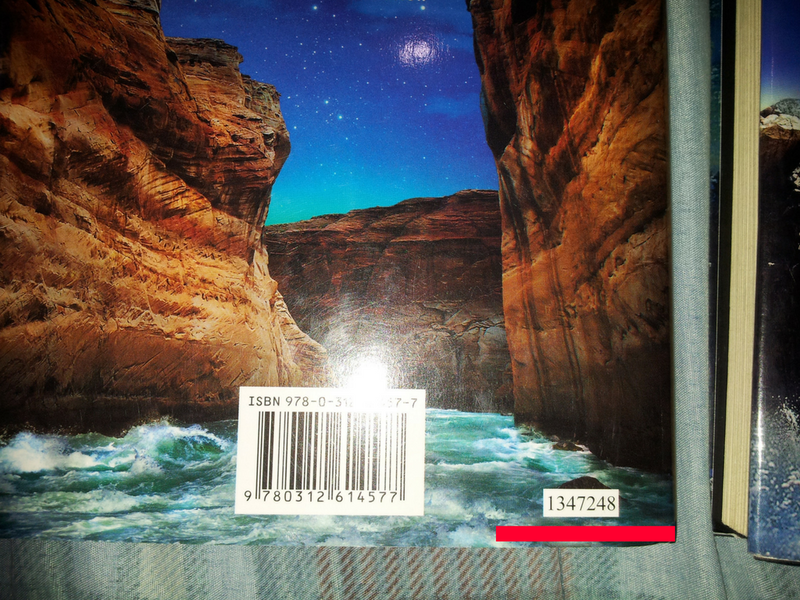 Many BCE books will have this small, 7-8 digital number near the barcode (if there is a barcode to begin with). But not all! And sometimes the number can be on the last page of the book. While I have an idea–and have researched for a definitive answer–I’m not 100% sure what these numbers mean. Honestly, people have many different answers. Some say the numbers represents the publishing date of book. Some say the number comes out of the limited production. And I've read that originally this number would plainly state how the book is a "Book Club Edition". That, for whatever reason, changed into random numbers. So if you see a book with an example of this, you've got a Book Club Edition. Whether it's stated plainly or not. 6. Last. One way to tell a BCE from books sent from the publisher lies in the first few pages. Well, as you can see, the majority of the information on the book is missing! Particularly the Library of Congress Cataloging-in-Publication Data. And, of course, any information indicative of what publishing edition the book is. As well as the book's publication month. All right. All right. I'm done going on about the subject. Those were a few differences I could point out–given my recent purchasing scenario. At the end of the day I've read these two books back in July, and just needed put a stamp on my collection. They're in great condition, and that's really all I can ask for. Had they been a hot mess, then this post would be about a whole different subject. When it's all said and done, I can kick back and enjoy an Anna Pigeon mystery anytime I want. I can relive any one of her adventures that carried me through this past summer. So that's a good place to be. I will keep an eye out when book browsing, should I come across publisher house releases of these two titles. But, in the meantime, this is certainly where I want to be. 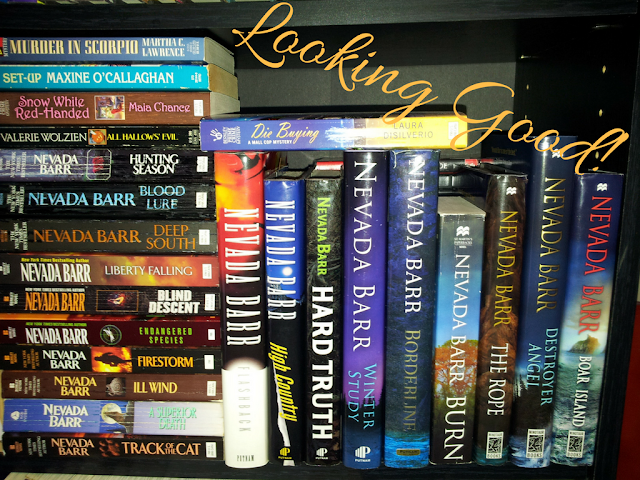 Share with me any of your Book Club Edition stories. Do you care for them? Or do you try to avoid them? What's your reasoning behind either? Leave your comments below.